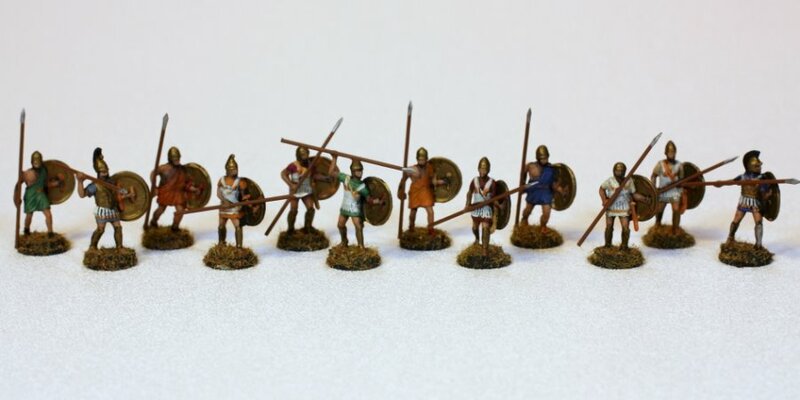 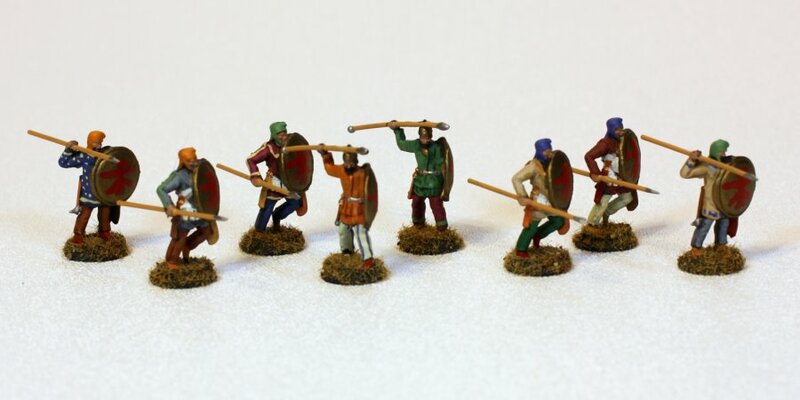 This article describes the preparation and painting of some 20 mm(1/72 nd scale) plastic miniatures.The subject of the article isfrom Hät's Achaemenid Persian Army.This inexpensive ($7.50) box contains 51 foot and 16 mounted figures - an excellent value.The range of unit types and poses for this price is unequaled by metals miniatures.Additionally, Hät and many other quality manufacturers (e.g. 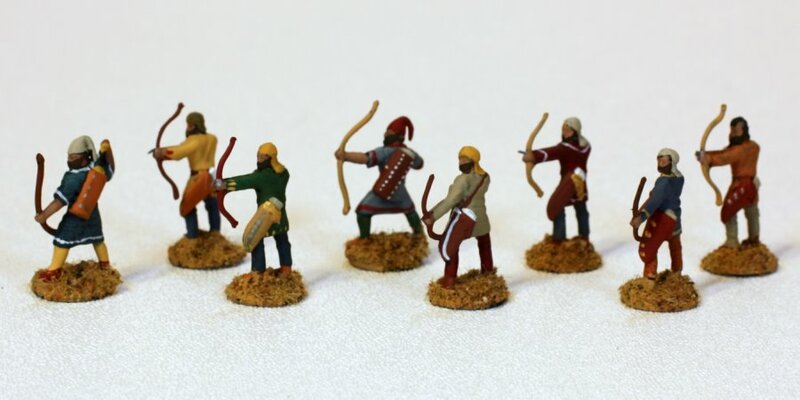 ESCI, Italeri, Zvedzda, IMEX, Stretlets)make many ancient figures to ally or oppose this army.See Plastic Soldier Review for many photos and write ups on all the different figures. 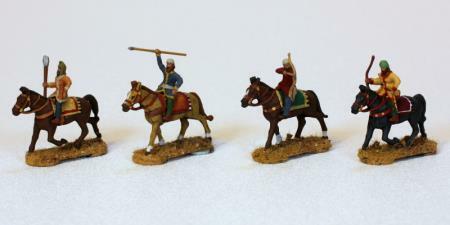 Alexandrian Macedonian Army Part II (April 2008). 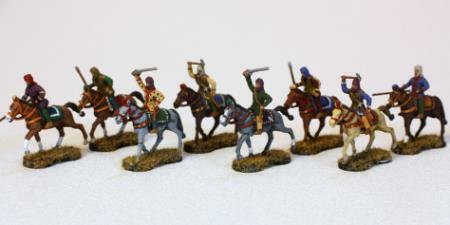 Alexandrian Macedonian Army Part III (April 2008). 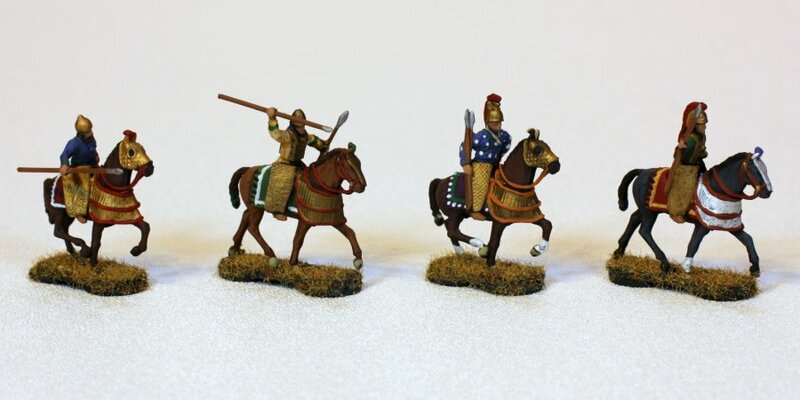 To the right are photos of the Persian Light Cavalry on unarmored horse.They include the Paphlogonian and Arachosian javelin men.I just like saying those names.Click on the photos to see larger versions. 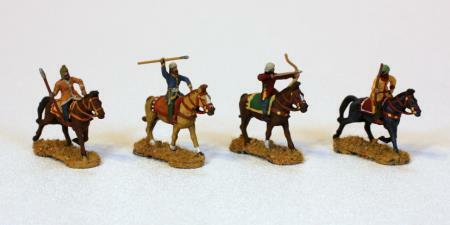 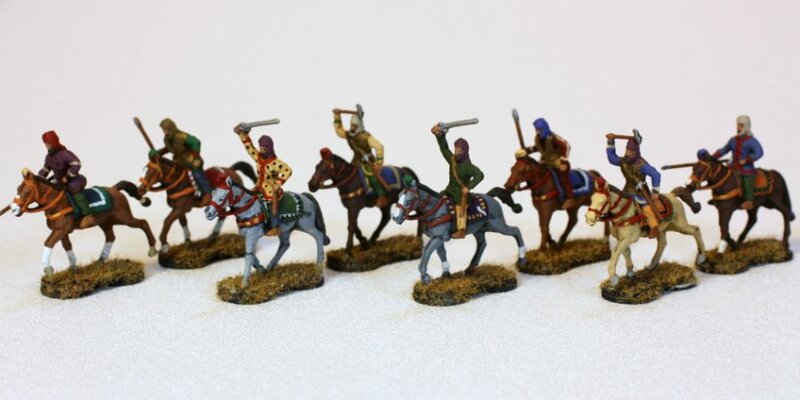 To the right are the Persian Heavy Cavalry. I like the scale armor onboth the riders and the horse.Two of the figures have very Greek looking crested helms. The figures are painted mostly withReaper Master Series paints.I use Reaper, Vallejo, Foundry, and many other paints.I like Reaper because of the wide range of colors, the eye-dropper squeezey bottle witha mixing pellet, and the thin fine nature of the paints.Some of the bronze armor is Vallejo bronze, a nice dark golden brownish color.Much of the speartips and chain mail is Games Workshop Citadel Colors - some of thebest metallics. 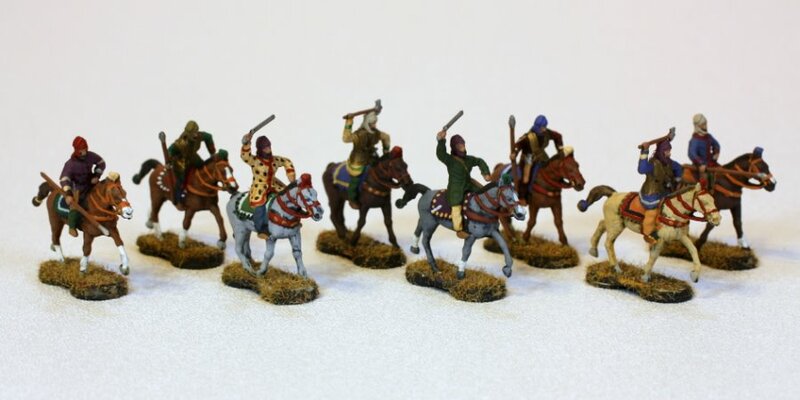 To the right are the Persian Medium Cavalry.The horses are unarmored, but the riders have some cuirassesand pleated skirt armor. 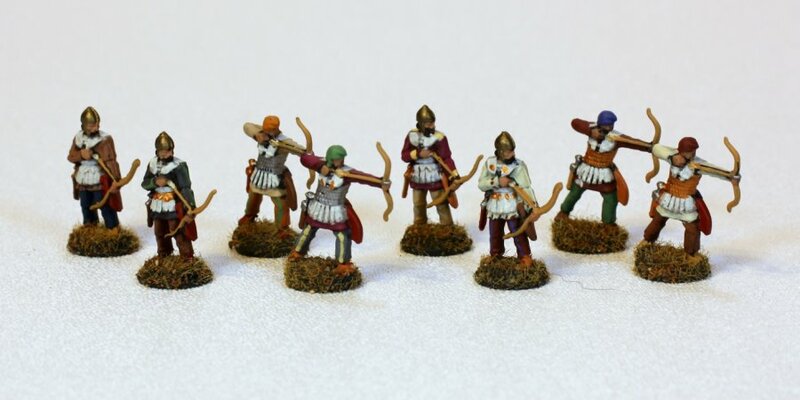 I painted the uniforms very brightly and richly with lots of decorationas I imagine the ancient Persians did when going off to war. 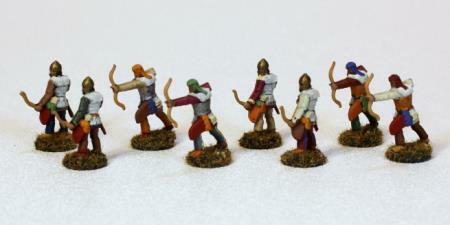 These are the Persian Light Bows.Unarmored. 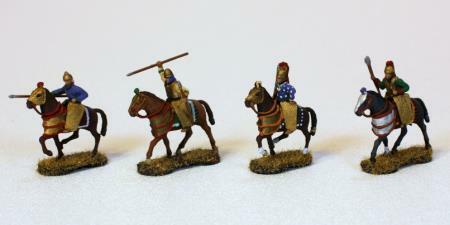 Two poses. 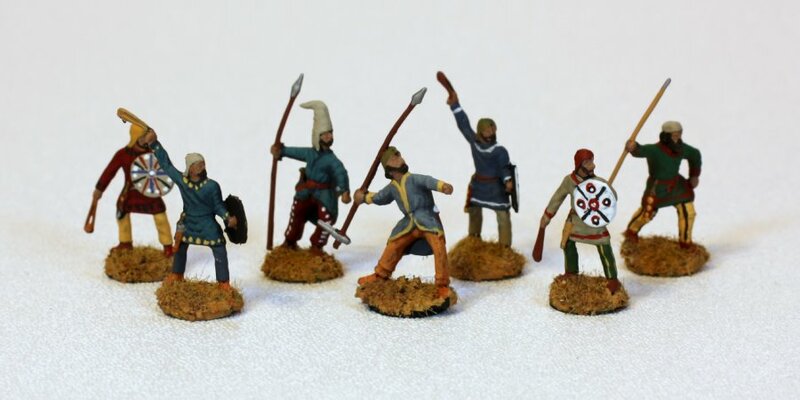 Soft caps. The figures are epoxied to a zinc washer which easily sticks to a magnetic basein case you want to form up units.The weight of the washer is much greater than the plastic figure, sothey always tend to stand up, even on hillsides and rough terrain.The base is flocked with a bit of white glue and static grass.The entire figure is then sealed with Krylon Matte varnish.I chose dry looking grass for the bases to help sort these figures and keep themseparate from the Greeks who have green grass. 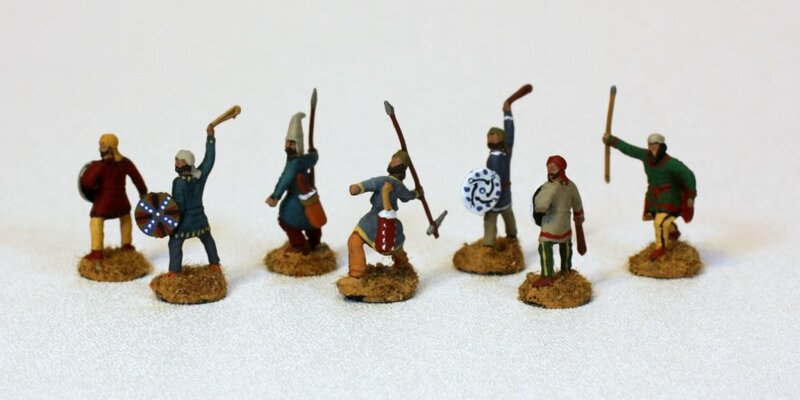 These are the Persian Light Infantry.I love the varied uniforms and poses.Unlike most of the other figures in this article,these figures have the original spears.Plastic spears can look a bit wobbly like wet spaghetti,but I really wanted to keep this one figure in the center with thedouble spiked spear.For some reason Hät only included 7 of these figures insteadof the usual 8 or 12 or 16 and thus the foot soldier count comes to theodd 51. 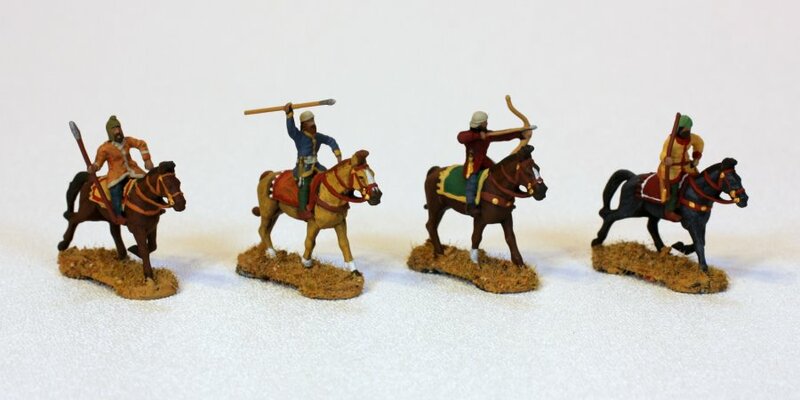 These are the Persian Heavy Archers.They have a mix of scale and linen armor which was in fashion at the time.These warriors are well appointed with covered bow case and swords. 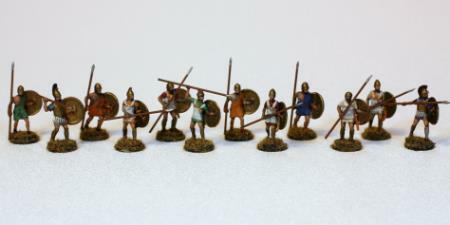 These are the Persian Heavy Infantry with aspis or hoplite bronze shields.Most of these warriors have brass wires for weapons.Snip a bit of wire and with a ball-peen hammer smash the end.Then sand to a sharp point, preferably with a moto tool and abrasive wheel.Careful, the points can really stab!The spears are epoxied to the soldier's hand.I could not find a good Persian motif for the shields, so I painted an abstracteagle motif. 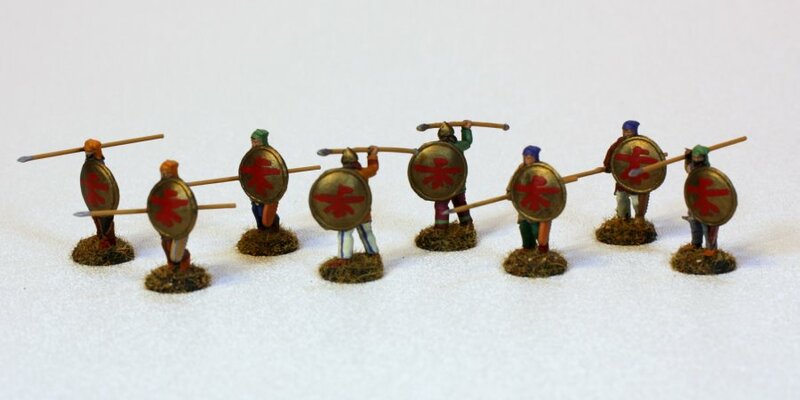 Here are more Persian Heavy Infantry with Thracian style curved shields.Again I just painted some abstract eagle design on shields.I like the hand spike weapon that some are carrying.That looks like it will easily puncture a shield or helmet.Nice to have a few regal looking standard bearers. 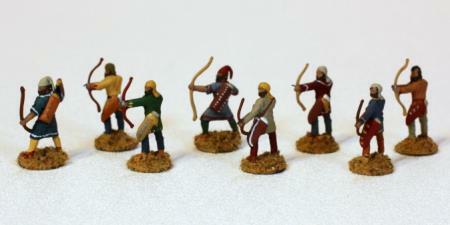 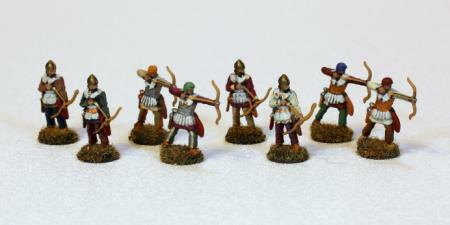 Finally, here we have some mercenary Hoplites. 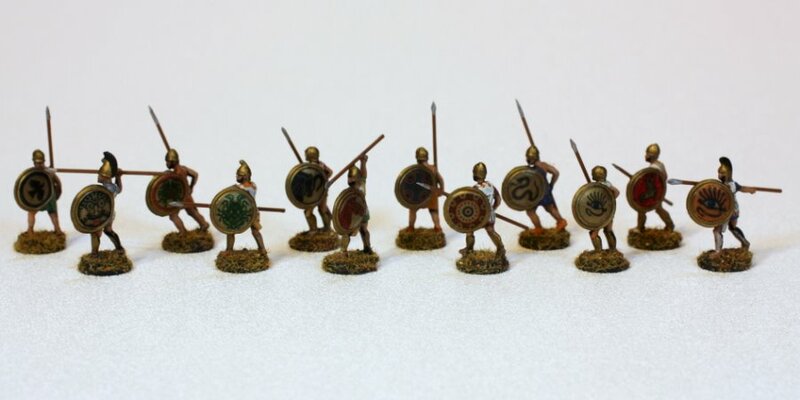 The Greek army has thesefigures too.I guess these warriors just hired themselves out to whicheverarmy had the better food.As mentioned before, the grass on these figures is dry brown tohelp distinguish them from the mercenary band fighting for the Greeks.I applied some decals to the bronze hoplite shield. These photos are taken on an "endless horizon" sheet of white textured plastic.I did attempt custom white balance, but I guess the room lighting is warm, soI ended up correcting the white again in post-production.Similarly, the auto exposure was fooled by so much white,regardless of whether I spot metered or other meter mode,the figures were under-exposed.So I ended up pushing the auto exposure by 1 stop.The photos were cropped down to a 2:1 aspect ratio.And the contrast range was expanded to the full range.I used Bibble to do the photo editing.Version 4.x has a clunky user-interface, but once you figure it out, it iseasy to batch edit the photos and queue them up for multiple size outputs.Great for working with big batches of pictures.In fact of you do 4 operations on your photos (e.g. 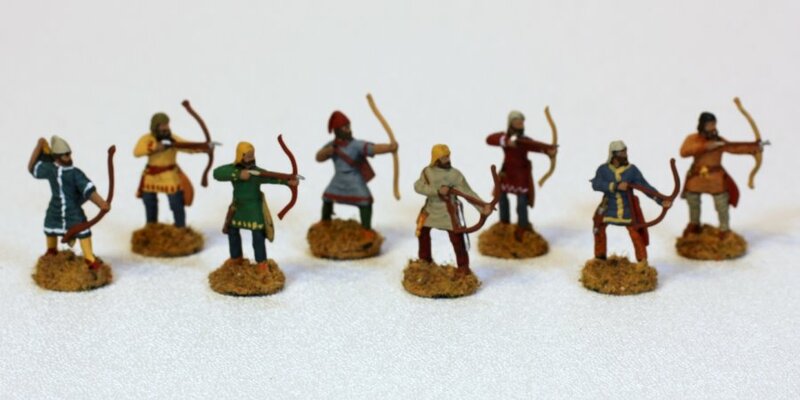 white balance, contrast enhance,crop, resize), it is not much different human workload to handle one photo or 50 photos.I can't wait until they come out with their version 5. 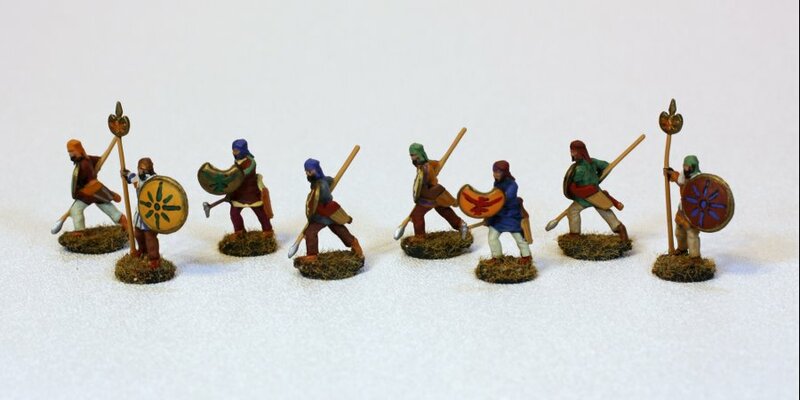 Well, that is all for now.The Achaemenid Persian Army box is now done, and it is time tohave a battle with the Greeks.I am evaluating some old school easy rules to have the battle.Will it be Darius and the Persians at the Battle of Issus?Or perhaps the Battle of Plataea.Thanks for reading about my miniatures. 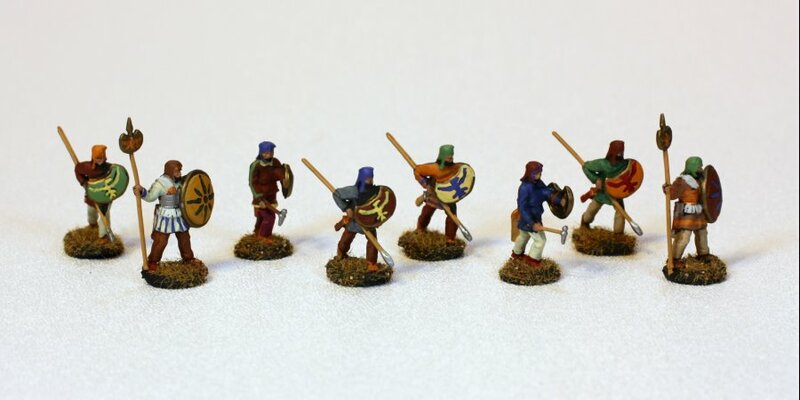 More links are at the bottom of the page. Last modified: Thursday, 09-Jun-2011 12:53:40 MST.